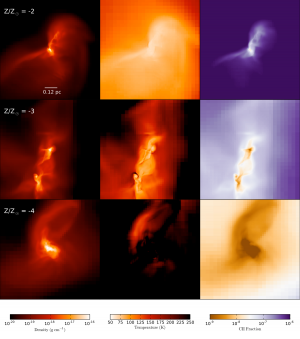 A team of researchers led by Dr. Stefano Bovino at the Institute for Astrophysics Göttingen (IAG) has conducted high-resolution simulations investigating the formation of the oldest-known star in our galaxy, SMSS J031300.36-670839.3, on a supercomputer of the North-German Supercomputing Alliance. Using the star's abundance patterns, the scientists have performed cosmological simulations which include the dynamics of gas and dark matter as well as the chemical evolution. From this simulation, the scientists expect to obtain an improved understanding of the transition from the first to the second generation of stars in the universe. The results of their study were published in the Astrophysical Journal Letters. The stars of the first generation have formed out of a primordial gas consisting only of hydrogen and helium. Their mass was ranging from ten to five hundred times the mass of our Sun. Nuclear processes in the interior of these stars have created heavy elements like iron, silicon, carbon and oxygen. When these stars died during the first supernova explosions, the heavy elements have been ejected, and stars of the second generation could form. "Even for the oldest-known star in the Milky Way galaxy, our simulations indicate that the gas efficiently cools due to the presence of heavy elements," says Dr. Bovino. Such conditions favor the formation of low-mass stars. The results therefore strongly suggest that the transition to the second generation already occurred after the first supernova explosion. "The heavy elements provide additional mechanisms for the gas to cool, and it is very important to follow their chemical evolution," explains Dr. Tommaso Grassi from the Center for Star and Planet Formation at the University of Copenhagen. The scientists have considered SMSS J031300.36-670839.3 for their study, as its abundance patterns were previously shown to be consistent with one single low-energy supernova. "It seems very likely that this star is indeed one of the very first stars forming out of the metal-enriched gas, providing the chemical conditions right after the first supernova explosion," says Prof. Dominik Schleicher at the IAG. While this star has a tiny amount of heavy elements, it has a relatively higher carbon abundance. It in fact represents an entire class with similar properties, and the scientists expect a very similar formation pathway for the entire class. "The mass of the stars mostly depends on the temperature of the gas, as gravity needs to overcome the thermal pressure during star formation," says Dr. Muhammad Latif, a scientist in the Göttingen Collaborative Research Center 963 on Astrophysical Flow Instabilities and Turbulence. The new simulations became feasible through the development of the chemistry package KROME, an effort led by Dr. Grassi in Copenhagen. In the future, the scientists plan to explore a wide range of possible conditions to understand the formation of the most metal-poor stars observed in our Milky Way galaxy.